It's a knitting blog silly. With occaisional interruptions for general crap. Well... I must say I haven't had the best summer and I'll be quite glad when I get on with life as usual (for me that's mostly good with a little bit of not good). Yesterday we (my mom, dad and I) had to put down our dear old dog Buster. Buster Tea Bear Junior, if you please. Buster had an exceptionally large tumor on his spleen causing massive internal blood loss. He had 10% of the normal red blood cells. He could barely walk and was having significant trouble catching his breath. We took him in to the vet on Monday when he stopped eating and found out on Friday about his blood work and he was in the hospital on Saturday for x-rays then back to us Sunday and Monday for goodbyes. I can't really talk about it any more than that. It was so so so hard and I have been very very sad for several days. I haven't knit a stitch or looked at my sewing machine and can barely get a pan to the stove. Hopefully I'll snap out of this in a day or two... or a week... whatever. I'm going to go get some lunch now and try to think about happy things. I made some really good Catfish last night and I wanted to share. Using another zippered plastic bag, combine 1cup breadcrumbs 1/2 cup corn meal and 1 tbsp kosher salt, and mix to combine. Add the catfish to the breading mixture, and just like shake n bake, shake it up to coat. Heat 1-2 tbsp vegetable oil in a heavy skillet and add fish, don't crowd the pan. Cook for 3-4 minutes on each side and then place on a rack to cool and drain off excess oil. Serve with potatoes and ceasar salad, make extra. That picture is from Fashion Fabrics Club and the call it "Dark Taupe" which is as descriptive a name for this particular color as any, I suppose. My question, if you purchase a dress, or suit or jacket in this color... what shoes would you wear? Surely not black, as Taupe is in the "brown" family... and despite what some people say, I still believe there are rules about such things. But a real chocolate brown? No... that would never do. What do you, oh wonderfully fashionable person reading this blog, think? The only thing I can think of is maybe gold? But that's a little... loud for everyday wear. Red might work if you had something else that was red in the outfit, like a belt or scarf. So I went to my embroidery class on Thursday. It was scheduled to have four students, and one teacher, so five people total... two showed up (including me) and neither of us was the teacher. After a half an hour Emily at Twisted said she had no idea where the teacher was (she had tried to reach her but couldn't) and she was really really sorry, and she rescheduled us for the next class plus gave us a 10 % off coupon. I felt bad for her because it's obviously not her fault that the teacher didn't show up. I just hope everything's okay. So then I went shopping. I told myself I could get some Yarntini using my KnitWars gold pieces ($1 per piece of gold). I was chatting with Emily, debating between "Home" and "Cosmopolitan" for my yarn choice, and she was showing me the Schaefer that they got in just yesterday. Including the Schaefer Andrea. Oh goodness... it was so soft guys, and PRETTY... and well... I just couldn't resist. I bought the "Diane Fossey" colorway in greens to make something lacey for my mom for Christmas. I'm not going to say how much it was, but you can probably look it up pretty easily on your own. *edited* So I was discussing with my mom what shawls she likes in my Victorian Lace Today book and when she pointed one out I said "and of course you want green" and she said "no, fuschia" My mother wears green... not fuschia... count on her to pull one out of left field like that but hey it's her shawl. I'm going to see if I can exchange my Diane Fossey this week. Today I have passed on the knits! One of my coworkers brought her daughter in today and I taught her to knit, she brought two colors of acrylic yarn and size 15 plastic needles. I showed her the long tail cast on and how to make a knit stitch, I taught her neither continental nor english style but told her to hold the yarn in the way that it felt most comfortable. She naturally went for English, which seems normal for a child's (10 years old) level of dexterity. Here's her little swatch of garter stitch (we haven't tried purling yet). I'm very excited to be teaching the goodness. 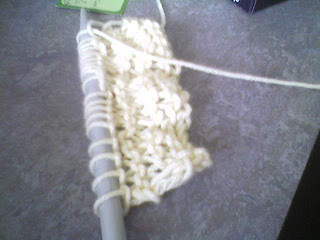 It was easier than I thought, I never thought I could teach someone to knit since I knit right to left (mirror knitting, for obstinate lefties) but as I showed her how to make a stitch I just reminded her that she would be using opposite hands and she did fine. So two of my good friends from my previous job came over last night for turkey burgers (I did not plate, mostly because one most fix one's burger the way one would like it) and wine and conversation. They also brought me birthday gifts because they are too kind. Both of these books were on my Amazon.com wishlist, however, being the dork that I am I forgot that and I cooed over my gifts "oh my God! How did you know I wanted that one? I've been thinking of buying it myself!" my friend proceeded to roll their eyes and then it occured to me "oh... these were on my wishlist huh?" and we had a hardy laugh. The moral of the story is, if you get me something from my wishlist because you aren't sure what to get me, then I'll just think you're very very clever and not realize that you are simply sneaky. Keep that in mind friends. I would also like to send a big shout out to Mia for sending me a box of goodies! I was very remiss in thanking her earlier, because I am simply a bad interwebs friend. She sent me some really lovely ribbon yarn from her stash, as well as this very neat papery yarn and a couple other skeins that I think shall be quite useful for the CHRISTMAS KNITTING (which I am naturally pretending isn't there). Thanks Mia! Thank you very much for your kind words. I am quite well and am sure that in a few weeks my little drama will have been downgraded from "red-alert catastrophe" to "minor inconvenience" I'm just dramatic like that. Nothing to report knitting or sewing. I haven't felt well enough to hunch over a sewing machine (perhaps I should not hunch...) and my knitting continues as discussed, I am finishing the gusset of my second pair of Bearfoot socks and working on MS3, which looks far to much like yarn puke to photograph. Tomorrow I take an Intro to Embroidery class at Twisted. I will be embroidering a tea towel with a pattern from Sublime Stitching the theme is "Swanky decor" which goes just great with my midcentury kitchen. I'll see if I can't capture some images of my embroidery efforts. On to my query, when I make dinner for Joel and I to share I always plate our food on our two plates and bring the plates, sans extra servings to the table, either indoors or out, which has already been set with napkins and silverware. This weekend I hosted a wee brunch for my friends and I set the table with plates and brough the food in serving trays to the table for everyone to dish as pleased them. I'm not sure why I did it differently, perhaps four people is my threshold for plate dishing? Maybe since I can easily carry two full plates to the table but must make two trips for four this seemed like the right way of doing things? What say you? do you plate or do you bring food to the table? I suspect that especially with children it is wise to just fill your own plate, since they can be so picky and also hungry. Plus asking for things to be passed and the act of passing helps teach good manners doesn't it? Okay... so I started a post yesterday that turned out sounding bitter and cruel... I'm going to try to be a bit more diplomatic and kind today. *note: Yesterday, when I was bitching to my mother on the phone she said "so what are you going to have for dinner? I mean besides a kitten"
I replied "F*** kittens, I hate kittens" that was the kind of day I had. 1) I have made marvelous progress on my latest pair of socks. 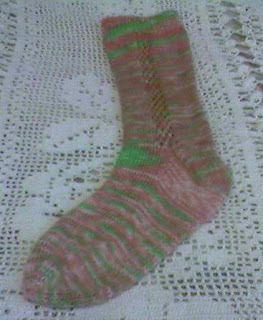 Pattern: Plain stockinette with a German Heel (from Knitting Vintage Socks... Nancy Bush... natch) and a round toe (same). Yarn: Mountain Colors Bearfoot in "Mountain Tango" this yarn is so amazingly beautiful... every time I pick it up I'm just giddy to see what the next color will be. I love you yarn. 2) The reason I have been so prolific... having just started these two weeks ago (besides that they are easy, and the yarn is a bit thick, worked with only 60 stitches) is that I was in a car accident last week and my car was totalled. I am now taking the bus. Due to a variety of economic and environmental circumstances, I will not be getting a new car. Besides, no car could ever be what Doris the Taurus was to me. I have been quite childish about the matter. Yesterday I said that I did not want to take the bus and my boyfriend, being ever so f---ing level headed responded "so ride your bike" to which I retorted "No! I don't wanna ride my bike, I want to drive Doris" and then I folded my arms over my chest and proceeded to pout. Because I am now 25 years old and it is well past time for me to act in such a dignified manner, don't you agree? I would like to leave you with a quote from "Miss Manners Guide to Excruciatingly Correct Behavior"
Who says there is a "right" way of doing things and a "wrong"? Miss Manners does, you want to make something of it? I should really save this post for tomorrow since who knows if I'll have anything to talk about... but I don't care. I live on the edge! The Interweave Knits Fall Preview is up. I'll definitely be purchasing a copy once it's available. Here's some of my favorites... which I will probably knit someday. I believe that knit dresses should be approached with caution. As with knit skirts. Not that they cannot be cute or flattering, but odds are that you should probably say no if the urge strikes you to knit a dress. In case you're about to say "but _____ is really cute" I will remind you that knit dresses are, in fact, sweater dresses (usually) We all remember that time don't we? Does anyone really want to return to the era of the sweater dress? Don't answer that. Okay... that's my knitting pr0n for today. Y'all come back now, y'hear? So I didn't actually get tagged with this, but I saw it on Mia's blog and it looked like fun. You go to Wikipedia and type in your birthday month and day only. Then post 3 events, 2 births and one holiday that occurred on your birthday, then tag 5 friends. 293 BC The oldest known Roman temple to Venus was founded. We'll see what else I can hunt down in the wilds of my craft room tomorrow.